How many times do you tap and click on your mouse or trackpad while working at your Mac? No doubt hundreds of times day. Well there’s an application called DwellClick that will automatically click buttons, links, and drag pages for you. DwellClick is a product of Pilotmoon, the maker of the awesome, click saving application, PopClip. 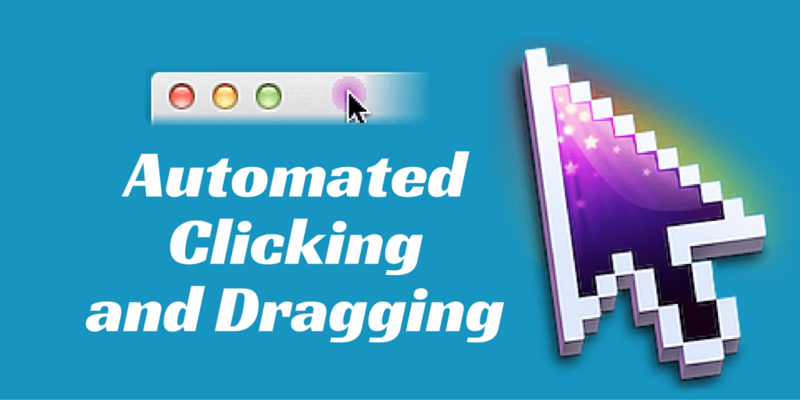 DwellClick clicks buttons, links, and auto-drags windows so you don’t have to. The best way to understand how DwellClick works is to watch it in action. In the following 12 second video, it will look like I’m manually clicking on the links, but actually DwellClick is doing that for me as I move the cursor from one link to the next. DwellClick is available for free trial download, and $9.99 in the Mac App Store. 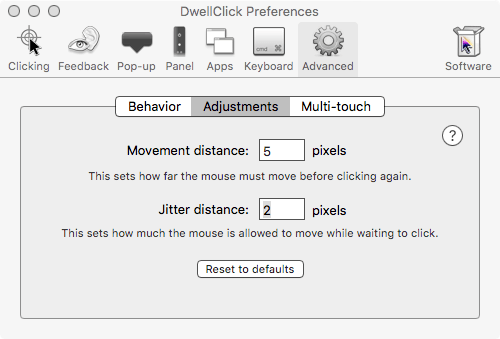 I’ve used DwellClick off and on for more than a year, and I have to be honest, it does require a bit of a learning curve, and it may at first be frustrating to use, especially if you’re in the habit of frequently moving your mouse around as you navigate in the Finder. But I like to use DwellClick mainly for two reasons: one, because I get tired of tapping on my trackpad to perform actions, even though I prefer tapping over clicking on the trackpad. (Note: you can set the tab option in the System Preferences > Keyboard). Secondly, I like the ability to rest the cursor on the menu bar of an application and then drag the window without having to perform a right-click as I drag. If you’re saying to yourself, “it’s no big deal to manually click, tap, or drag stuff,” well you’re probably not annoyed enough with clicking or tabbing like I am to use DwellClick. But if you want the power of auto-clicking buttons, links, and activating windows, then you should indeed give DwellClick a try. The key to using DwellClick is figuring out how long the cursor rests before it clicks an item. You don’t want the delay to be too short because then it will click things too fast, and you don’t want it too long because that slows up your movements. You may spend several days adjusting the delay to set a speed you’re comfortable with. 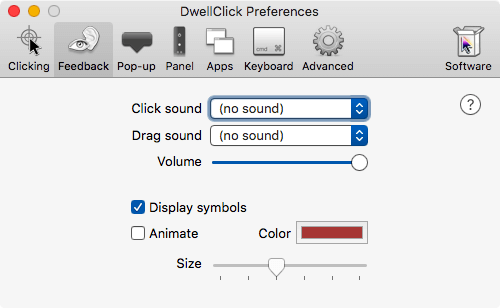 The Preferences settings for DwellClick include a Feedback feature that when enabled gives a clicking and dragging sound as it performs the actions for you. You can also enable an animation that lets you see where DwellClick is clicking. You probably won’t want to leave this feature enabled permanently, but it might be useful when you’re first starting to use the program. There’s also an advanced adjustment you can fiddle with that sets how far the mouse can move before the auto-clicking occurs again. The default is 10 pixels. I changed it to 5. There’s additional adjustments for how you want DwellClick to behave as you use it, including a feature for designating which apps you don’t want DwellClick to function in. Or maybe you only want it to activate in certain applications where you perform mainly mouse movements and clicks, such as in the Finder. DwellClick helps relieve RSI and it’s also great for anyone with difficulty a clicking physical mouse button, including head-tracker users. 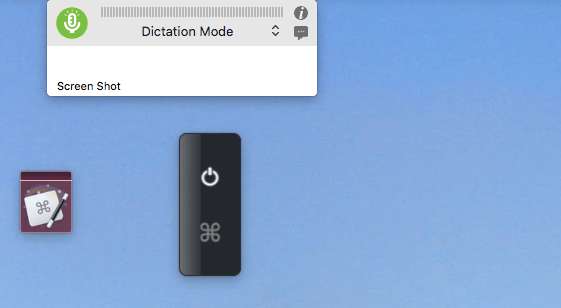 I do toggle DwellClick on and off as I work, mainly because it can be cumbersome to use for some work I do on the computer. To toggle DwellClick, I map its hotkey to a Keyboard Maestro string trigger which enables me to toggle it as I type. A Dragon Dictate voice command and a BetterTouchTool finger gesture also do the same things. The DwellClick floating palette can also be used for toggling, as well as enabling modifier keys to perform certain actions. The palette on my desktop sits near the Keyboard Maestro global palette and Dragon Dictate recognition window. None of them get in the way of my workflow. DwellClick is not for the faint hearted. I only recommend it for Mac users who work at their computer throughout the day and who want to reduce mouse clicks or tapping, and dragging. Or it might also be most useful for working in particular applications like Photoshop, iTunes, or the Finder where the mouse or trackpad is used often. DwellClick is available for a free a trial download, so I suggest checking it out, even if just to see what is possible for this type of automation. Let me know what you think of DwellClick and if you plan to—or how you currently use it— in your workflow.